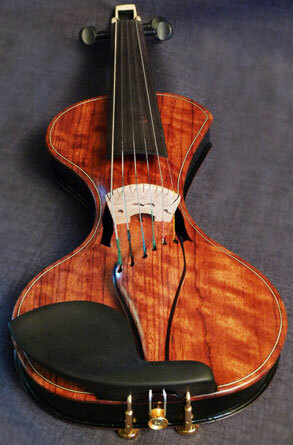 Offering custom electric violins, violas and cellos. One of a kind instruments handcrafted to the specifications of the discerning string player. Hello, and welcome to my website. I thank you for taking some time to look through the various sections, and encourage you to visit the Electric Violin Gallery page so that you may see some of the instruments I have made. I have been working as luthier since 1999. The most important aspect of my work as a luthier is to offer a player the opportunity to, literally, design and create the instrument that they have always wanted, usually an instrument that they have not seen anywhere else. You choose the shape and design of the instrument, the number of strings the instrument will have (4,5,6 or 7), what wood the instrument will be made from (even select the piece of wood yourself), the type of bridge and electronics that will be used, and whether you would like to use traditional pegs or tuners similar to those used on electric guitars. All of these aspects – within the limits of physics and patent considerations – can be decided by you if you desire to have an instrument made or commissioned. If, at any point, you have any questions at all, feel free to e-mail or call me. I will answer all of your questions to the best of my ability. My goal, and what I strive for every hour that I work, is to provide violinists, violists and cellists the finest sounding, the most beautiful and comfortable instruments available, and to do my best to craft an instrument according to the desires and specifications of the player. In this way, the finished instrument will be what the player envisions. If you have always desired a beautiful, personalized electric violin, viola or cello, and have not seen that instrument – your “dream instrument” – in any other place, and thought: “If I could only find a person who would make the instrument that I see in my mind”….you have found that person. It would be an honor for me to craft any instrument that you might desire. David Burham is dedicated to making beautiful electric violins and cellos for the musician desiring a handcrafted, personalized and lightweight instrument. I will collaborate in crafting an instrument of your own design – your “dream instrument”. The particulars – the shape, choice of wood, electronics, number of strings, inlay – all are your choice. The price of the instrument will be determined on an individual basis. The instrument has been designed for efficiency of motion and ease of performance in all genres where a reinforced string sound is desired. The unique “S” shaped design and first ink drawings were finished in the summer of 1999. Weight, easy access to even the highest positions and a simple yet elegant style were my prime considerations. At 1.2 pounds, the DBCV electric violin is one of the lightest violins on the market, making it relaxing to play, even for hours at a time. As players will immediately notice, there are no “shoulders” on the instrument. For those players desiring the shape and feel of an traditional instrument, an extension in the shape of the right upper bout of an acoustic instrument will be added, if requested. Prices are reasonable for a quality instrument. DBCV™ lets you select the type of wood from which their instrument will be made, type of finish and style of peg. In addition, every DBCV™ violin is personalized with a plaque inside the electronics housing giving the owner’s name, date finished and luthier’s name. A form-fitted shoulder rest is provided with every instrument. 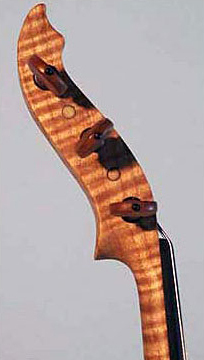 To see examples, visit my Electric Violin Gallery. For inquiries please call David Burham at (541) 343-0771 or email for more information. 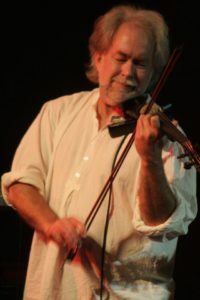 David Burham has performed for 33 years, currently with the Eugene Symphony, Oregon Mozart Players and The Sugar Beets and he is currently accepting new students. 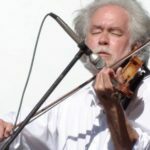 Lessons are offered for violin, viola, beginning cello and keyboard while including lessons with improvisation in these styles: country, fiddle, celtic, blues, rock, jazz and world music. Also available for repairs and rehairing bows. Sliding-scale available.